Skyscript.co.uk :: View topic - The 1945 bombing of Dresden. The 1945 bombing of Dresden. Posted: Fri Jan 19, 2018 1:10 pm Post subject: The 1945 bombing of Dresden. Do any of the planet and sign placements describe what happened? Phaethon is about 10 or 11 degrees Virgo, retrograde. The Pisces Moon was exactly opposition it as the warning sirens went off. And the Ascendant at 21 degrees Libra has an antiscion of 9 degrees Pisces. Neptune in Libra seems significant, and Libra is the sign of the upper levels of the military, the generals. 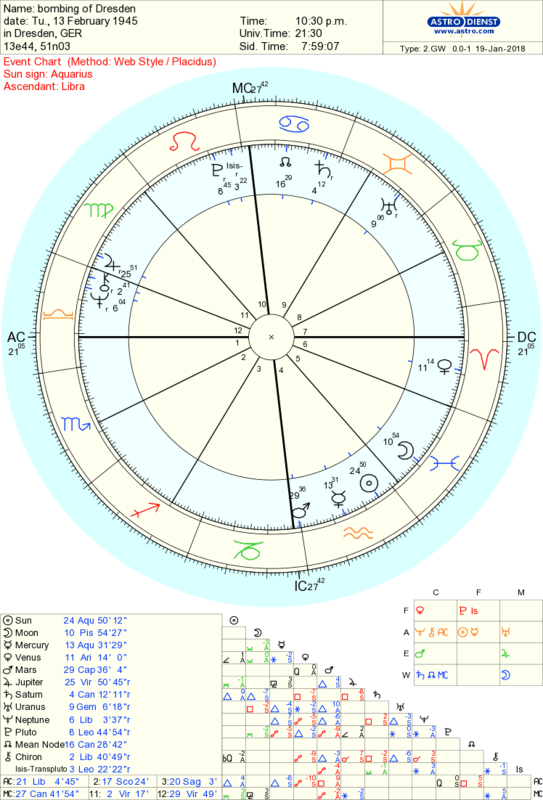 I would suggest that the reasonably tight sextile between Pluto and Uranus (10th-8th houses on the 21.51 CET) could well possibly indicate a fire storm, but with any chart connected with a larger sequence of events, I believe that it has to be read in context of the nature of the event itself. Which World War 2 chart one would start to look at is anyone's guess, as there are so many of them to choose from. Yes I agree, and it wasn't until after I posted the chart that I realised that this would be just one of many activations of Neptune in Libra, another of which was at the suicide of Adolf Hitler. I had actually confused the bombing of Dresden with another attack on Germany during the second world war, when they bombed the dam, I think that was in the Ruhr district, to disable this important industrial area of Germany, but it seems all it really achieved was to damage farmlands and cause ordinary people to starve. That Hitler suicided is a somewhat moot point. The firebombing of Dresden was really a retaliation for the years of jerry's relentless attacks of English towns and cities. It wasn't just Adolf Hitler. I don't think anyone disputes that Joseph and Magda Goebbels and their innocent children died? And many European towns and cities had hundreds and thousands of years of history destroyed, mostly replaced by plastic. Violence DOES solve problems, then. Maybe Operation Paperclip was just a pragmatic strategy to stop the Soviets getting hold of German scientists? I doubt that many top Nazis escaped, probably not the Goebbels even though it would be nice to think the Goebbels children weren't murdered. Note that the Mars/MC axis is on what Rhetorius referred to as the "Gateway to the Gods". Jupiter is close to Benetnash/Alkaid eta Ursa Major. This star means "hired mourners" and Ebertin writes " Experience has shown that many human lives are to be mourned." The ascendant is on the exaltation of Saturn. There are many who claim that Hitler did not commit suicide and escaped to South America along with many other Nazis who went underground (literally). Operation Paperclip we may know about but it seems the Nazi influence over the post WW2 world went far deeper than this, their occult connections being very significant in this respect. Peter Levenda and Joseph Farrell are among writers who have written on this subject. I wish there were a way to look at the astrology of this but but I can't think of a relevant method. Perhaps horary would be useful ? Perhaps "Did Hitler commit suicide" is a bit too simplistic and asked too many times !